What afflicted the sugar apple? Some of my fruits have been ruined with these coverings that has the texture of an ant mound which is also very hard to remove since it is binded by a white sticky fibrous "substance", whatever that may be. Is this caused by some kind of borer? Is the remainder of the fruit good to eat? 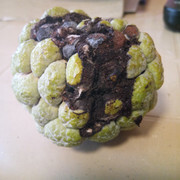 Re: What afflicted the sugar apple? Some pest we never want to get here. Any suggestions on how to treat such infestations? It's good that it hasn't reached Florida soils yet. It really brings down the plant's productivity. Isn't there a famous University right there in Los Banhos? Have you inquired there?